What a wonderful Collection with the characters from previous books coming together for the holidays! 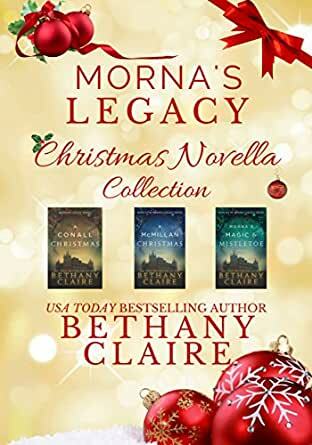 I have loved all of the books in Morna's Legacy and know you will become a fan,so start with Love Beyond Time where Past meets Present on a very magical journey!!!! 5.0 out of 5 starsMerry Christmas! Having read all of the Morna books I was very pleased to find a special price for the Christmas stories. Enchanting and funny. This three pack was delightful! Kept me wondering what was coming next. A lot of fun! Kenna and Malcolm are separated by 300 years, but not even time can keep them apart. Bethany Claire does it again! I rarely do a review like this. I am doing so because novellas rarely interest me. BUT each of these are so well written, one can forget they're short stories.